Christmas is coming a little early this year. 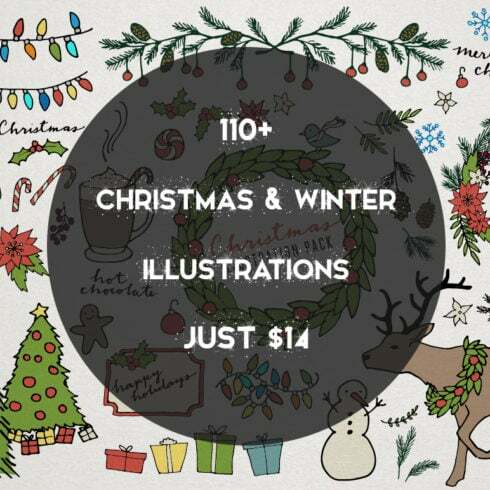 That’s because this Master Bundles features more than 110 Christmas and New Years illustrations at a massively discounted price. These illustrations are just perfect for creating everything from holiday cards to advertisements. Normally, this mega vector collection sells for $105 but for a limited time only, you can get all 110+ Christmas and New Years Vector Designs for just $14! That’s a monstrous savings of 87% off the regular price. Click the BUY NOW to add a little Christmas Cheer to your artistic toolbox today! This is a set of 75+ vector format Christmas and holiday themed illustrations. Includes christmas trees, presents, snowflakes, wreaths, poinsettia flowers, mistletoe, holly, pinecones, hot cocoa, and lots more! 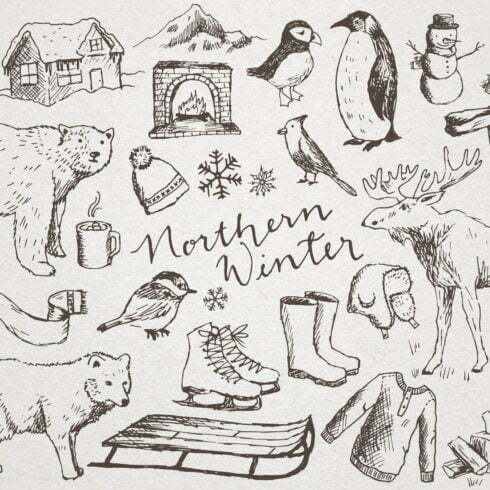 34 hand drawn sketched winter clipart illustrations include a snow fox, penguin, polar bear, sled, sweater, cabin, moose, snowflakes, chickadee, cardinal, puffin, birds, mountains, sweaters, hats, hot cocoa, and much more! Great for scrapbooking, designing invitations, party themes and decor, logos, and anything you can think of. • All artwork in individual transparent 300dpi PNG files.